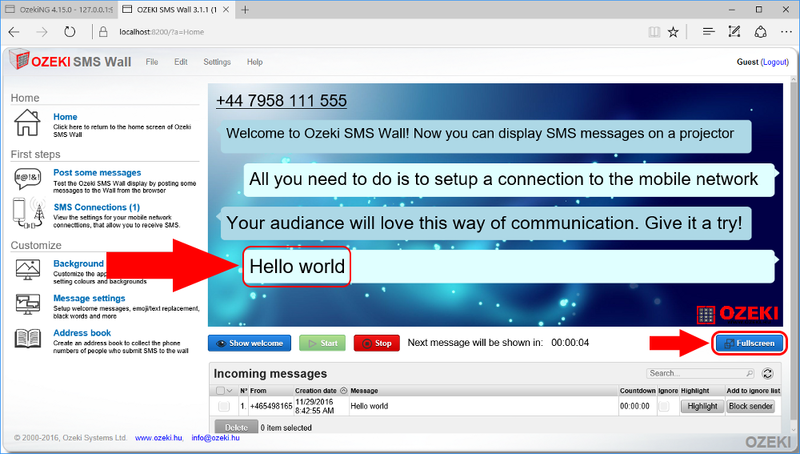 You are able to connect Ozeki NG SMS Gateway to Ozeki SMS Wall for incoming SMS messages to appear on the display. 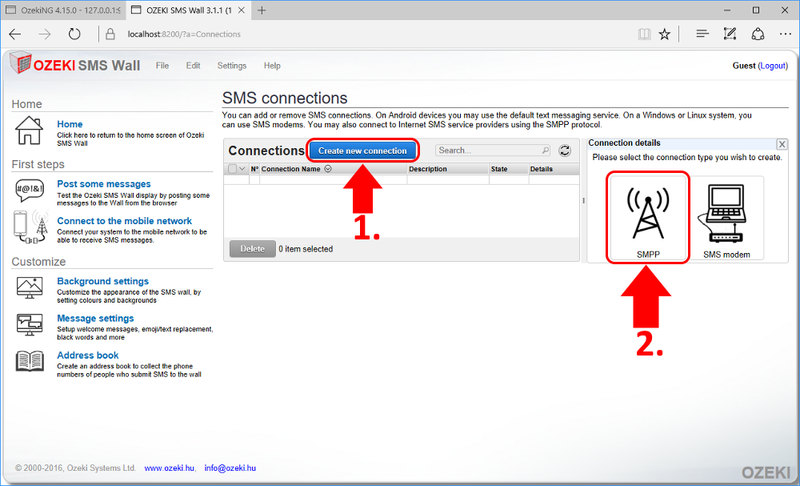 The incoming SMS messages can arrive through any connection that is supported by Ozeki NG. The first step is creating an SMPP user in Ozeki NG. 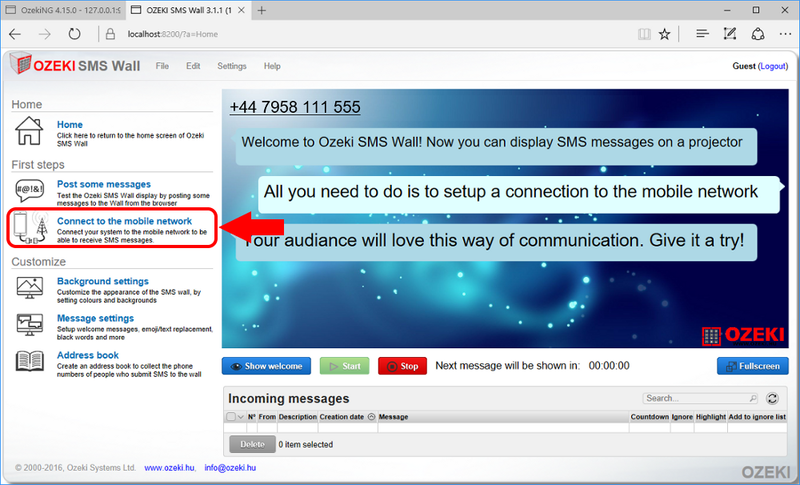 You will connect this user to Ozeki SMS Wall, so every SMS sent to Ozeki NG can be forwarded the SMS Wall. 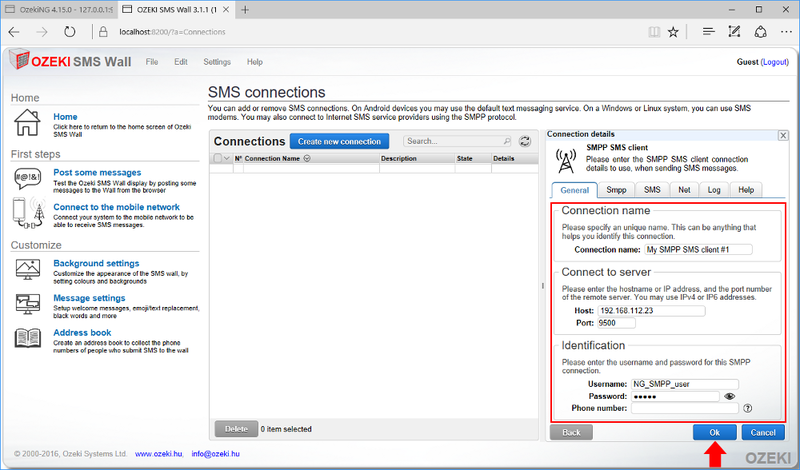 First, check if NG has an SMS service provider connected to it, you can see this on the left side of the browser. 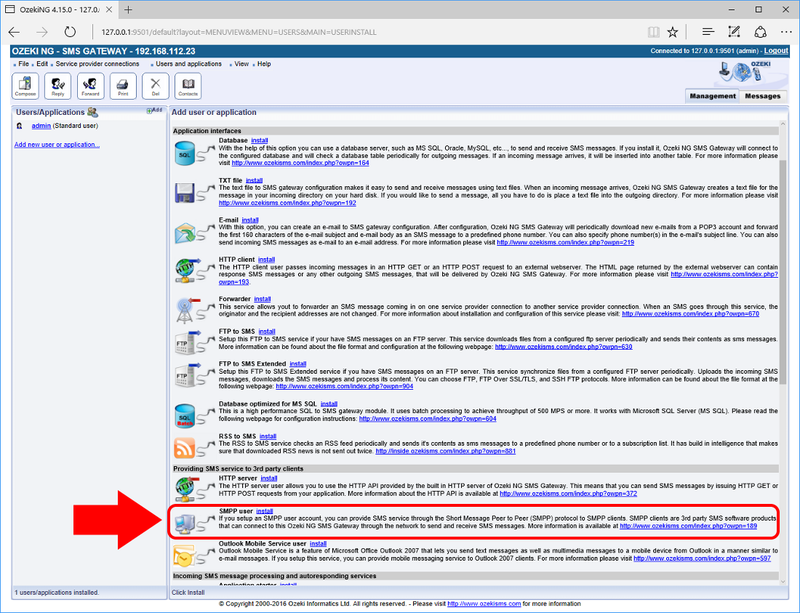 If there is an active connection to NG, click on 'Add new user or application...' on the right side of the browser window (Figure 2). Now please scroll down and select SMPP user installation by clicking on the 'install' link (Figure 3). 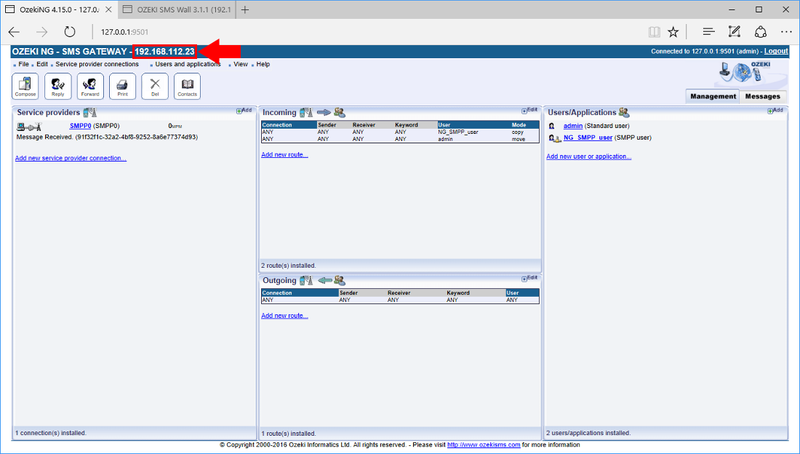 Now it is time to provide the SMPP user application name in the textbox. You cannot use spaces or any other special characters. When you are ready click 'Ok' (Figure 4). Here you can set the password and click 'Ok' (Figure 5 - 2). Your NG SMPP user is successfully created. Later on you will need the username and password in Ozeki SMS Wall. Click on 'Management' to see the routing table (Figure 5 - 3). It is necessary to route incoming calls to your freshly created NG SMPP user. 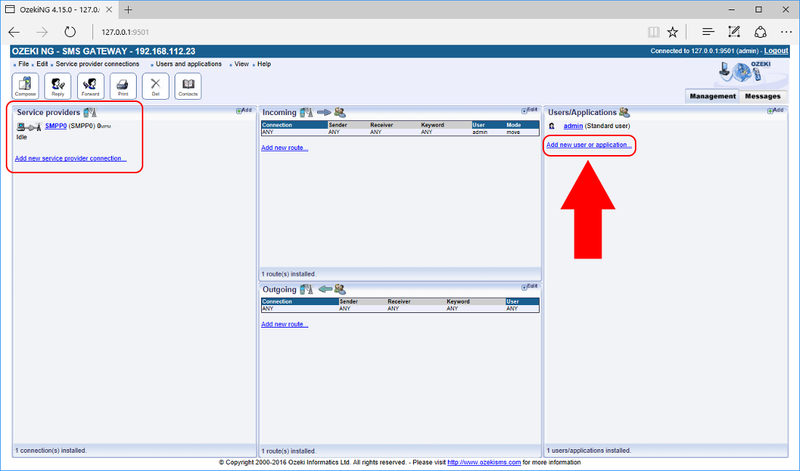 Click on 'Add new route...' in the 'Incoming' section to configure path (Figure 6). Select destination user and click 'Ok' to insert new path into the routing table (Figure 7). If you look on the routing table you will see your freshly added row in the 'Incoming' section (Figure 8). Now it is time to start Ozeki SMS Wall. First, you will find yourself on the home page. Click on 'Connect to the mobile network' on the left side of the home page (Figure 9). 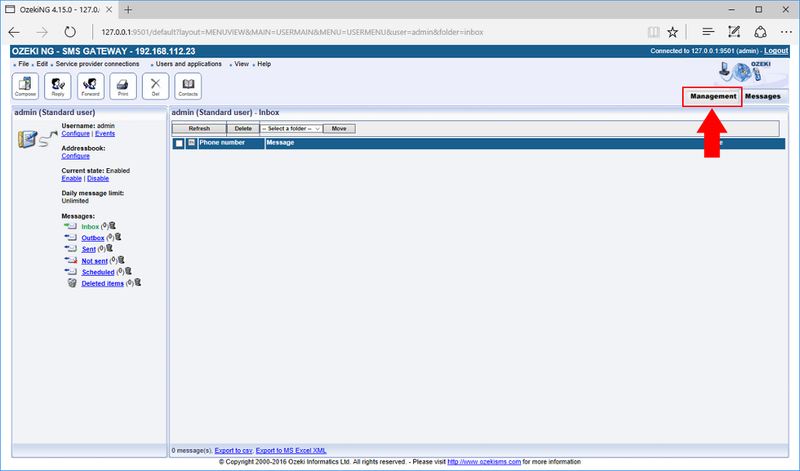 Click on the blue 'Create new connection' button and select 'SMPP' from the opening box on the right side (Figure 10). Now it is time to fill the 'Connection details' form in Ozeki SMS Wall. The default port number should be 8500. The username and password should be equal to the SMPP username and password combo you have previously created in Ozeki NG (Step 1) Click 'Ok' to continue (Figure 12). In the 'Connections' list you can find your setup SMPP connection with a red X next to it. The red X means it is not yet connected. Click on the 'Connect' button to connect to the Ozeki NG SMPP user (Figure 13). It can take up to a minute for the green tick to appear. After it has appeared click 'Home' to return to the Wall (Figure 14). 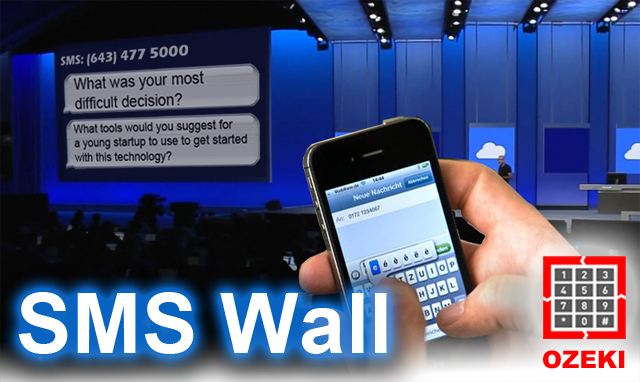 The time has come to test your SMS Wall. Please send an SMS to the phone number registered to NG (Figure 15). 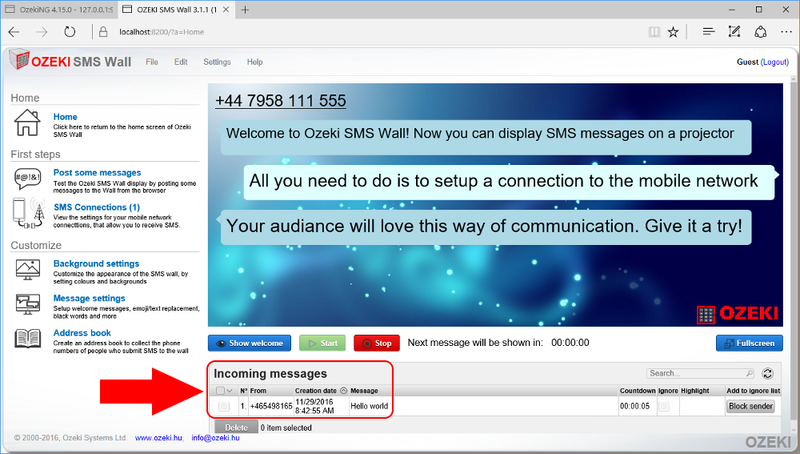 In Ozeki SMS Wall you will see the SMS arrived in the 'Incoming messages' section (Figure 16). In this section you can delete incoming messages before they appear. After the time delay has passed the message automatically appears on the Wall (Figure 17). You can set it to fullscreen mode if you would like your audience to easily read it. Just click on 'Fullscreen' (Figure 17).